The New Zealand Poker Championships has gained popularity among New Zealands poker enthusiasts in recent years. In 2012, the year when the first edition of the festival was run, it seduced 90 entrants with Paul Hockin winning the championship. Thanks to its attractive format and structure, the attendance rate has steadily increased from 2013. This year, the $ 1,650 buy-in championship Main Event attracted 136 players at Christchurch Casino. After 27 hours of play, it was Jay Gilbert who came out victorious of the battle. The Wellington native actually owes his victory to a sheer patience coupled by an aggressive playing style. This is his first-ever big achievement in live tournaments. 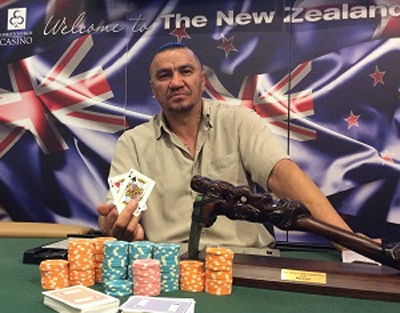 With this triumph, Jay Gilbert enters the New Zealands big poker names arena. The 2015 NZ Poker Champs final table was packed with action. It saw 44 survivors. It only took a couple of hours of play for the finalists to stand up from the pack with Gilbert holding one of the days biggest stacks. He successfully made it through the ultimate clash while notable names, including Darryl Hussey (7th), Mike King (6th) and Geoff Smith (4th) were sent to the rail. Charles Hawess fall to 3rd-place somewhat paved Gilbert and Jason Browns way to the heads-up. Both men agreed on a deal, seeing either title contender capturing $ 40,500 of payday each. And it was Gilbert who wrapped the 2015 NZ Poker Championships up on top of the podium, relegating Jason Brown to runner-up. This page has been viewed 1185 times.